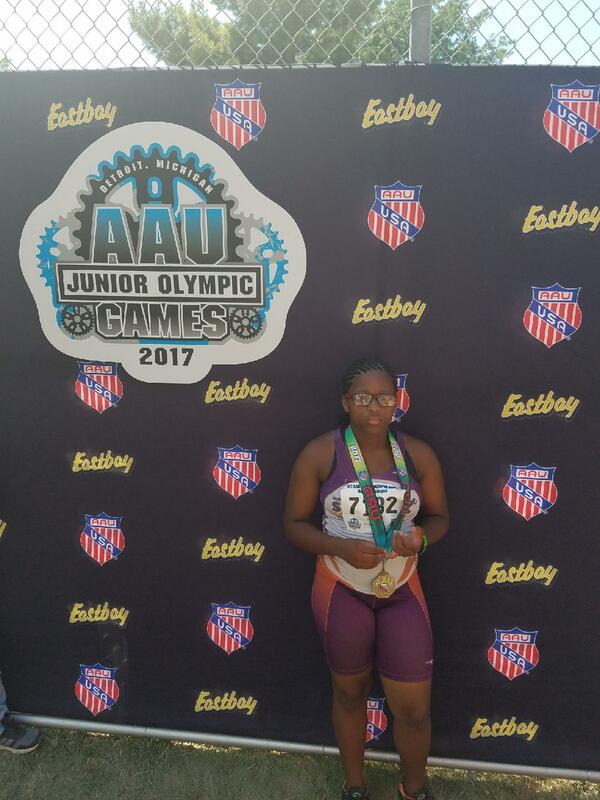 Jaiden Anderson got things started off right for the Sonics with a 5th place medal in the 13 Girls Javelin with a throw of 77′ 10″. 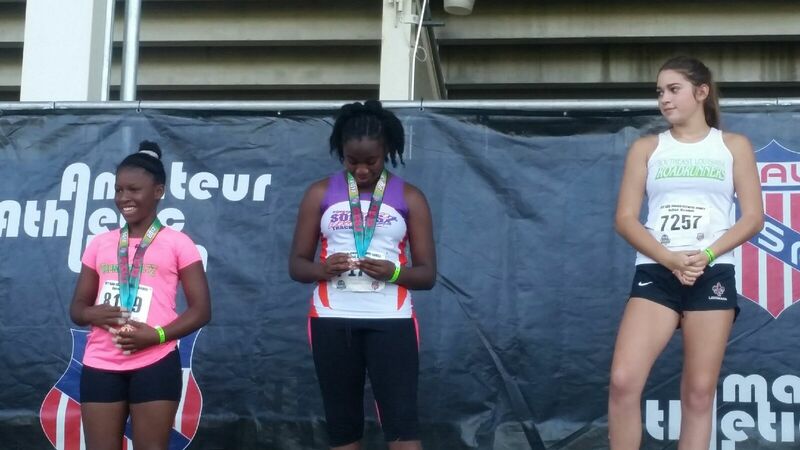 Octavia Gee followed this up with a 3rd place medal in the 11 Girls Discus with a throw of 79′ 5″. Isaiah Bocock then turned in a PR time of 2:17.75 in the 13 Boys 800 Meter good for 28th place out of 87 athletes. Jayla Cooper, Jonathan Cooper, Jurnee Smith, and Makai Amezola all competed in the 100 Meter Dash, but failed to advance to the semi-final round. 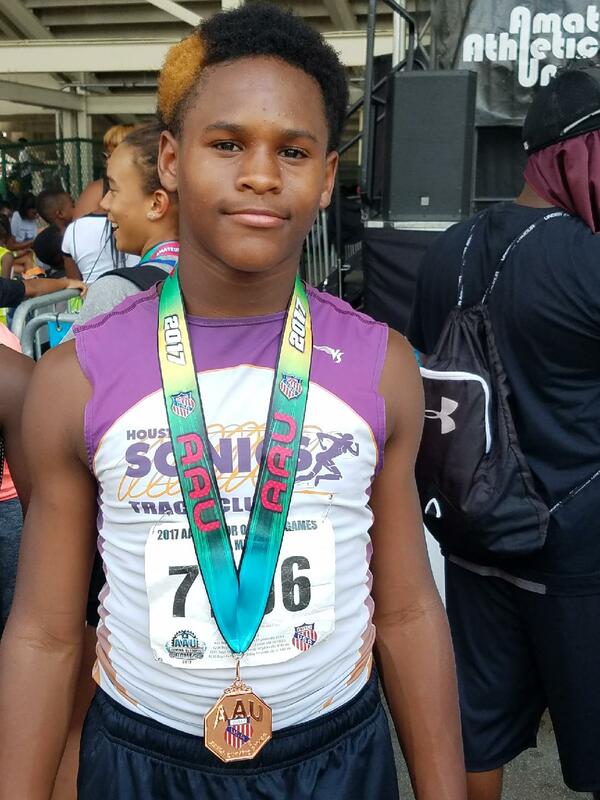 The Sonics got off to another strong start in the field events with the sibling duo of Damario and Octavia Gee each medaling in their respective events. 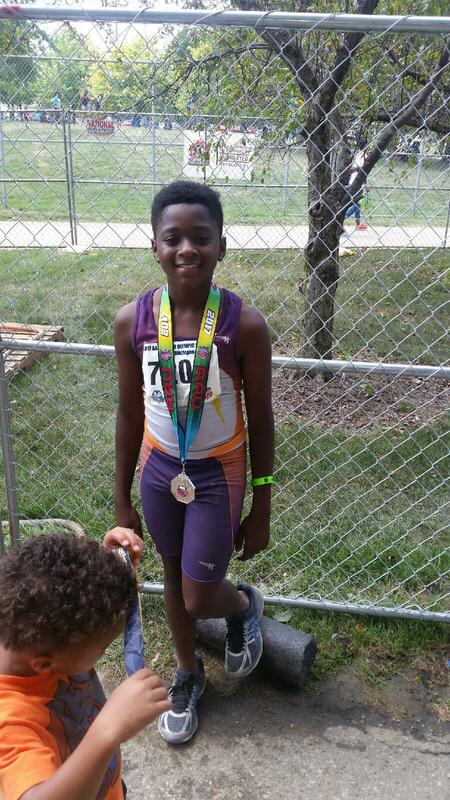 Damario took 2nd place in the 12 Boys Turbo Javelin with a throw of 121′ 2″ while sister Octavia won the 11 Girls Shot Put with toss of 38′ 3/4″. 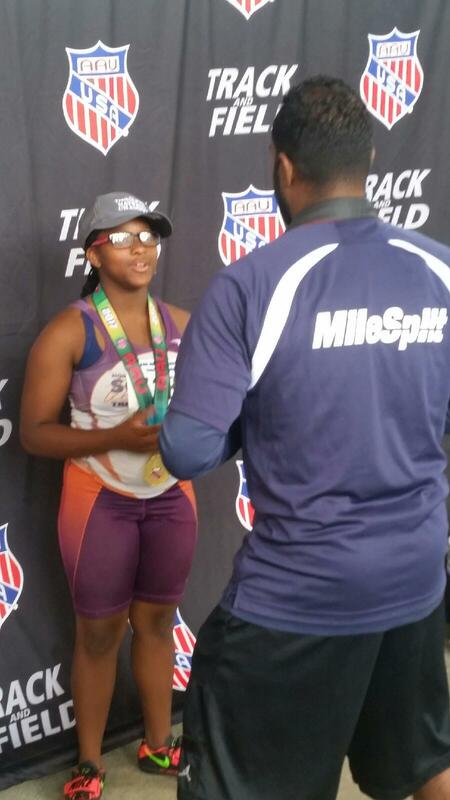 This is Octavia’s fourth consecutive Junior Olympics title in this event. 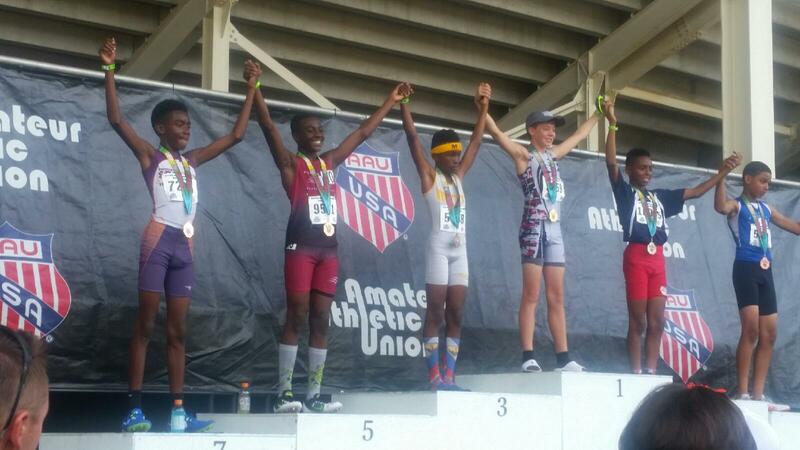 Also competing in field events were Anthony Chatman in the 12 Boys Turbo Javelin, Shaffer Henderson in the 13 Boys High Jump, and Isaiah Bocock in the 13 Boys Long Jump. On the track, Kenneth Burgess and Cesley Williams competed in the 13 Boys and 14 Girls 200 Meter Dash, respectively, but neither qualified for the semi-final round. In the 400 Meter Dash, Ryann Dedmon and Zoe Miles raced in the 9 Girls division and Kylah Woods in the 10 Girls division, but none of them advanced. The times posted by Cesley, Ryann, and Kylah were all personal bests. The Sonics continued their momentum today and even took it up a notch. Todd Woods ran a PR of 2:15.98 in the 12 Boys 800 Meter to earn the 7th place medal. Zoe Miles, Anyssa Solis, and Kenneth Jones also competed in the 800 and Jayla Cooper ran in the 80 Meter Hurdles event. Soon afterwards, Kenneth Burgess beat his personal best in the 13 Boys Shot Put by over three feet en route to earning the 5th place medal. 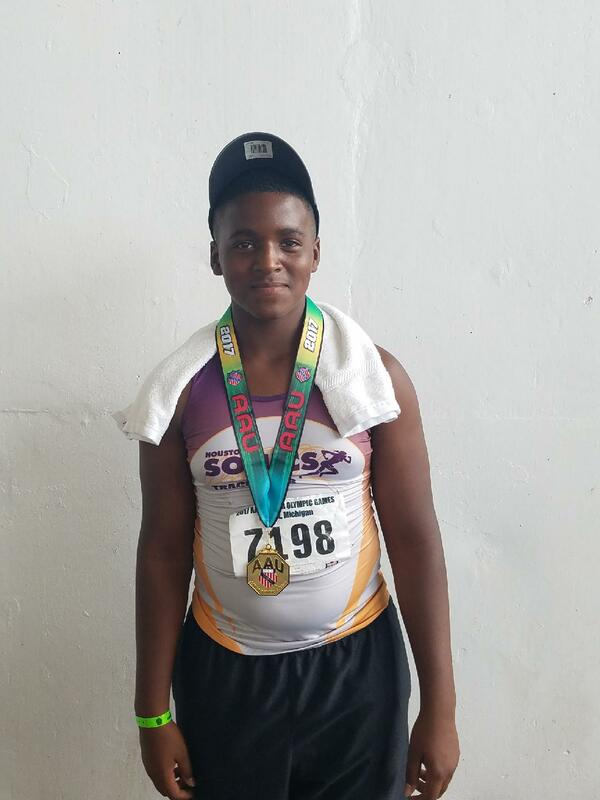 The third medal of the day came in a big way with Anthony Chatman winning gold in the 12 Boys Shot Put with a throw of 46′ 11″. And finally, the day finished on a positive note when both the 9-10 Girls and 11-12 Boys 4×400 relay teams qualified for Saturday’s final! The Sonics medal count now stands at seven and counting! Today was a relatively quiet day for the Sonics with only two individuals competing in the field events along with two 4×400 relay teams. Anthony Chatman competed in the 12 Boys Discus and Shaffer Henderson got a PR in the 13 Boys Triple Jump, but neither managed to reach the medal stand. Both the 13-14 Girls and 13-14 Boys 4×400 relay teams ran season best times (the boys improving on their qualifying time by a whopping 17 seconds! ), but still weren’t fast enough to qualify for Saturday’s final. 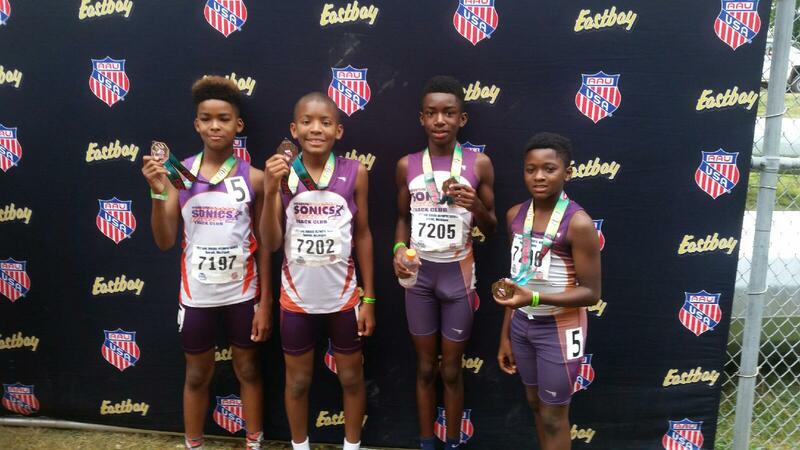 Another busy day for the Sonics and it started off with a bang with the 11-12 Boys 4×800 Relay team of Damario Gee, Todd Woods, Kenneth Jones, and Mason Chapman claiming third place, bringing the Sonics’ medal count to eight for the Games! We were represented by five teams in the 4×100 relays: 9-10 Girls, two 11-12 Girls teams, 13-14 Girls, and 13-14 Boys. All produced solid performances, but fell short of reaching Saturday’s final round. Naomi Jones competed in the 11 Girls Long Jump while Alana Bennett and Jamie Nwokeji threw in the 13 Girls Discus. None of them reached the medal podium, but Jamie had a big PR by more than 13 feet! We closed out the day with three athletes racing in the 400 Meter Dash, Jasir Miller in the 13 Girls division, Cesley Williams in the 14 Girls division, and Cameron Williams in the 15-16 Boys division. Unfortunately, none of them managed to advance to the finals. The Sonics closed out the JO Games with two more medals, bringing their total medal count to 10. The 9-10 Girls 4×400 relay team took 7th place while the 11-12 Boys 4×400 relay team finished in 5th place. Congratulations to everyone for their outstanding performances! Awesome Job to all that competed!! !